Beautiful weather over the weekend. Temperatures in the 70s and overcast off and on during both days. Another nice day today, 70s and overcast. Slight chance of showers tomorrow with cool temperatures. I think we might see the 80s Thursday and creeping back into the low 90s by the weekend. We are looking at chances of showers starting Friday. Generation schedule has been fairly consistent. Low generation in the mornings, followed by two units starting up sometime after noon. The weekend was wonderful….no generation almost all day both Saturday and Sunday. They hit one unit for an hour each day late in the day. Stan had Daniel and Zamir from Springfield on the water for half a day Saturday. Definitely better then that tough day last week! Good day for these gentlemen on the black copper head midge and a b-bug. Darrell’s guys from here in Branson, Donald and Mark, also did well on the black copperhead midge. One of the ladies who took our July full-day fly fishing clinic decided it was time to venture out and test her skills and knowledge. Pretty sure she has this fly fishing figured out. She caught this nice rainbow on the black copperhead zebra. Of course, I had to venture out to see how she was doing and fortuntely was there to take a picture of one of her rainbows! Decided to wet a line and was happy to start catching fish again on the holographic green crackleback on the sinking leader. They have not been hitting this pattern for a while and I keep trying. It is working again, especially on a nice sunny day. Sunday, Jim took David and his son Hunter out for some instruction and some catching. They learned a lot and had a good day catching on a varigated CQ streamer and stripping an orange body 56er. Guess who else was out….Debbie. This time, she not only caught fish on the midge, she threw a black size 12 wooly bugger on the sinking leader and caught several fish on that. She is ready for another weekend! 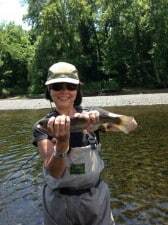 This entry was posted on Monday, July 29th, 2013 at 1:53 pm	and is filed under Fishing Reports. You can follow any responses to this entry through the RSS 2.0 feed. You can leave a response, or trackback from your own site.